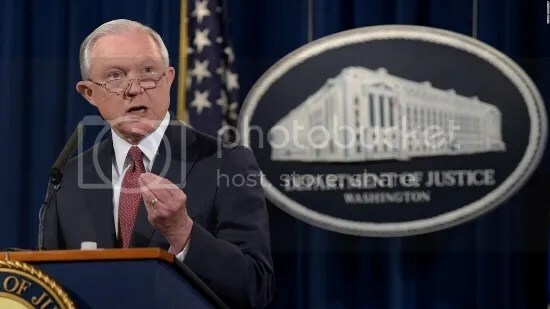 Attorney General Jeff Sessions announcing the termination of DACA. (Susan Walsh/AP). See this article published in Politics Means Politics. On September 5th, President Trump terminated the Deferred Action for Childhood Arrivals program, or DACA, created by President Obama to protect young undocumented immigrants from deportation. Called an “amnesty-first approach” by the Trump administration, DACA allowed young adults brought to the US illegally, often referred to as ‘Dreamers’, to obtain driver’s licenses and work permits. Despite DACA’s popularity, the White House indicated that it favors using the legislative process, giving Congress six months to codify the program, for protecting undocumented children from immigration enforcement. By doing so, whether knowingly or not, the Trump administration may have saved DACA from legal jeopardy and offered Dreamers a better chance to escape deportation. After failing to pass immigration reform during his first term, President Obama used his executive power to create DACA, which immediately deferred deportation of about 1.7 million undocumented people under the age of 30. Shortly thereafter, President Obama implemented the Deferred Action for Parents of Americans program, or DAPA, which protected illegal immigrants whose children were U.S. citizens or lawful permanent residents. Similar to DACA, DAPA offered work permits, driver’s licenses, and other government benefits to program participants. In 2015, however, DAPA ran into legal trouble. During that year, the state of Texas sued the Obama administration, arguing that DAPA violated the Administrative Procedure Act (APA) and the Take Care Clause of the Constitution. Ruling in favor of Texas, a Federal District Court enjoined the program on the grounds that it violated the APA, but left the constitutional issue unanswered. Later that year, the Fifth Circuit Court of Appeals upheld the District Court’s ruling, finding that Texas had established a substantial likelihood of success on its claim that DAPA violated the APA. With the lower court’s injunction in place, the Obama administration was precluded from implementing DAPA. Without DACA protection, Dreamers will be subject to deportation under US law. (Charles Reed/AP). With that in mind, and given its similarities to DAPA, it is unlikely that DACA would have survived a legal challenge had President Trump decided to continue the program. The US Constitution gives Congress plenary power to craft immigration law. Among other things, this includes the authority to determine who may enter the US, how long they can stay, and whether they receive permanent residency. But the Obama administration found a creative way to circumvent Congress’ legislative prerogative. By making Dreamers low-priority for deportation, and not giving them permanent residency, the Obama White House interpreted DACA as an enforcement action and not lawmaking by the executive branch. This legal theory, however, raises the issue as to whether the president can selectively enforce valid immigration laws. As Chief Executive, the president must execute the laws of the US- even ones he or she believes to be unpalatable. According to the Fifth Circuit, this means that the president cannot “establish a blanket policy of non-enforcement that awards … benefits to otherwise removable aliens.” More than likely, the Court’s statement renders programs like DACA unconstitutional. But President Trump’s decision to terminate DACA may prove to be a saving grace for the popular, yet unconstitutional, program that has benefitted many people living in the US. For example, discontinuing DACA shifts the burden of ratifying the program to Congress. Fearing that DACA would fall to impending legal challenges, President Trump called on Congress to “legalize” the program . If codified, DACA would become valid law, rather than an administrative action, which would shield the program from further legal scrutiny. 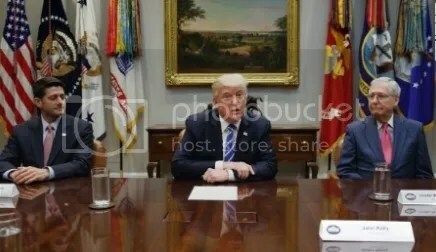 President Trump, flanked by Speaker Paul Ryan and Majority Leader Mitch McConnell. (Evan Vucci/AP). Additionally, President Trump’s decision has uncovered the tremendous amount of public support for DACA. Just hours after the program was ended, protests formed around the country as people offered their encouragement to Dreamers. Finally, President Trump has voiced his own support for Dreamers, expressing a desire to codify a permanent solution for young undocumented immigrants. “I have love for these people,” President Trump said of the Dreamers, later adding that they “have nothing to worry about” in the six months before the program is ended. So, in rather perverse fashion, a program that protects undocumented children from deportation might be saved by a president who campaigned on an anti-immigrant platform. Such is politics in Washington DC. But instead of decrying President Trump’s decision to end DACA, immigration advocates should use the program’s popularity, in the White House and with people across the country, to pressure Congress to craft constitutional legislation that protects our fellow Americans known as Dreamers.